The sheer number of monitoring benefits you can get from a device in your ear means that the forthcoming "AirPods 2" may have a big future in Apple's health plans —and there is still more they may be able to do. You know that Apple is going to release an updated AirPods 2 at some point. If you've just got one of the existing model, though, then you typically like them so much that it's hard to imagine how they could be improved. And, if you've had them since their launch in late 2016 then you're probably wishing that their battery charge had stayed as great as it was. The only thing we know for sure is that AirPods 2 will have a wireless charging case. But, there is so much more that Apple appears to be planning. Through the company's latest hiring and its filed patents, we can get an idea of where the AirPods are going. So much of this is to do with medical functions, though, that it looks like Apple is concentrating on health at least as much as it is, say, audio quality. Maybe we'll get the rumored "Hey, Siri" audio feature next, but there are a startling number of things Apple could do with a device stuck in our ear. AirPods were announced in September 2016 and just barely made it to online orders by the end of that year. 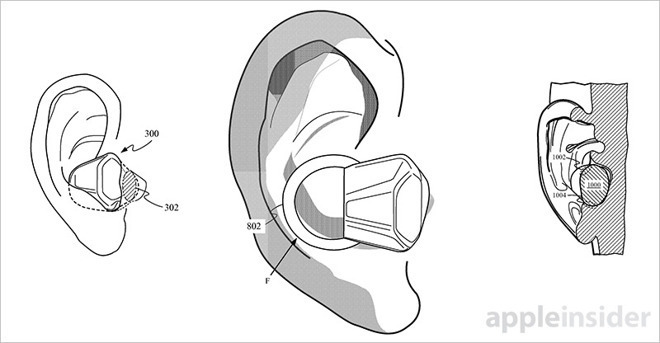 However, as early as September 2015, Apple had applied for three patents to do with Earbuds with Biometric Sensing. So, this is not something new. Apple has been working on the AirPods for years and that included health-related uses for them. These patents weren't known about until after they were approved in early 2017, when the much-delayed devices were finally appearing in Stores. All three, though, are to do with variations on, using AirPod-like devices as hearing aids. We eventually got this feature, or at least a version of it, in September 2018 when iOS 12 was officially launched and included what Apple calls Live Listen. So that's three years from the patent being filed to the feature being part of a shipping iOS. Apple is playing a long game here, as it so often does, and it's also leveraging its entire ecosystem. Live Listen uses the iPhone's microphone, iOS's ability to send data over Bluetooth, and then also the AirPods. The drawings included with those 2015 trio of patents don't resemble AirPods but others do. There was a 2014 patent from Apple for sensor-packed health monitoring headphones with 'head gesture' control and there's only one thing in the drawings that stands out as not being about AirPods. 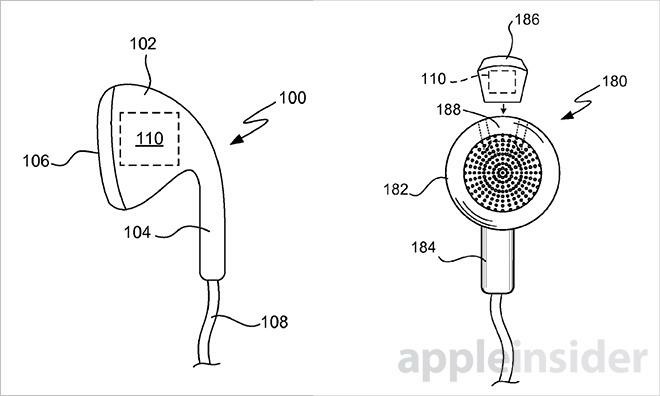 True, the very end that you stick in your ear has a different shaped design in the final AirPods but really the only difference is that these drawings show wires. Then the description of what the patent covers fits right in. AppleInsider, summarized the 2014 patents. According to the patent, the fitness monitoring system is cleverly ensconced in a set of headphones, something users commonly wear to listen to music during workouts. By positioning the headset in or near the ear, the embedded activity sensor can pick up temperature, perspiration and heart rate data, among other metrics. In addition to skin-based readings, an accelerometer may also be incorporated into the earbud chassis to facilitate the collection of accurate movement data. Some embodiments call for multiple accelerometers, each corresponding to a different axis. We can continue to extrapolate from Apple's filed patents but we can also examine just what is physically possible with an in-ear device. Some of these already seem like quick wins for Apple, such as motion monitoring. Right now we associate this with the Activity app on our Apple Watches but there are good reasons to think that we'd get better information from our ears. Even now when your Watch tells you that you need to take a brisk walk, you can't help but shake your wrist exaggeratedly or even dance around a bit. The Watch isn't very easily fooled by that wrist motion, but unless you also head-bang a lot, a monitor of your head movement could be more accurate. And it could also be more useful because it maintains that accuracy over a longer period. The more you can have someone wear a monitor, the more complete the data recorded. So as long ago as 2013, the IEEE Journal of Translational Engineering in Health and Medicine (abstract)described the problems of attaching devices when you want to study a problem such as sleep apnea. "Because many sensors need to be attached to the patient, the quality of sleep is reduced which, in turn, can affect the results of the examination." The paper's authors then presented preliminary results from trials meant to "evaluate the feasibility of the in-ear sensor for cardiovascular monitoring during sleep." Their concern was over a patient's ability to keep the monitor in place without either disrupting them or affect the data that was being recorded. Nature magazine later looked at the practical issues of wearable monitoring equipment and how in-ear alternatives could also help with more social issues than technical or medical ones. "We address these challenges through an inconspicuous earpiece, which benefits from the relatively stable position of an ear canal with respect to vital organs," it says in July 2017's Hearables: Multimodal physiological in-ear sensing (abstract). "Current physiological monitors... are inconvenient and/or stigmatizing." Nobody's ever accused Apple's various EarPods as being inconspicuous, but if they stand out very visibly, we're now so used to seeing them that we no longer pay any attention. With a device that both goes in your ear and stays there for a significant amount of the day, you can get a more reliable measure of movement. As the 2014 patents claim, you can also check temperature. The problem is getting them to stay in your ear. Current AirPods don't suit everyone's ears any more than Apple's wired EarPods do, but the company will need a much more snug fit to get certain health features working. And it's working on it. According to yet another patent, this time in 2018 and called Earbuds with compliant member, Apple has proposed ways to position the AirPod earpiece in a way that gets it enough continuous contact with your skin to take measurements. Motion detection needs you to have the device stable in your ear but then other measurements need much more. Your Apple Watch today can monitor your heart rate by using a photoplethysmogram (PPG) sensor to shine light on your skin, so could future AirPods. A stable, steady fit for the AirPods gets more important with even further types of measurement that could be possible such as an electroencephalogram (EEG). 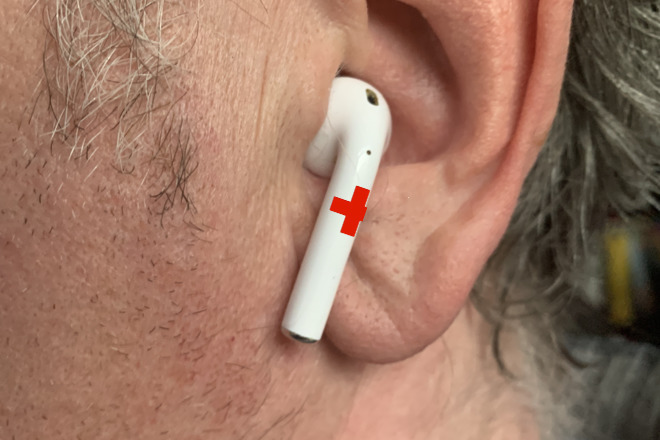 Medical experts AppleInsider spoke to say that AirPods could well be used for this, but it's some time off. "[with existing in-ear EEG protypes] they still need to wet it with saline solution to maintain a good contact," says our expert. "Otherwise you would get a lot of motion artifacts [data readings affected by movement] and also have to deal with electrical impulses from chewing or speaking." With that three-year gap between hearing-aid idea and the Live Listen feature launching, none of this can be expected to be quick. You can imagine that any AirPods 2 will include at least some of these possibilities, but it's more likely that Apple is already looking at AirPods 3, 4 and beyond. There aren't many companies that could be spending multiple years researching for future products and there probably aren't any but Apple who are actually pioneering this work. It's something that does seem important to the company and so much so that Tim Cook said he believes it's what the firm will be remembered for. "I believe, if you zoom out into the future, and you look back, and you ask the question, 'What was Apple's greatest contribution to mankind,' it will be about health," he said.